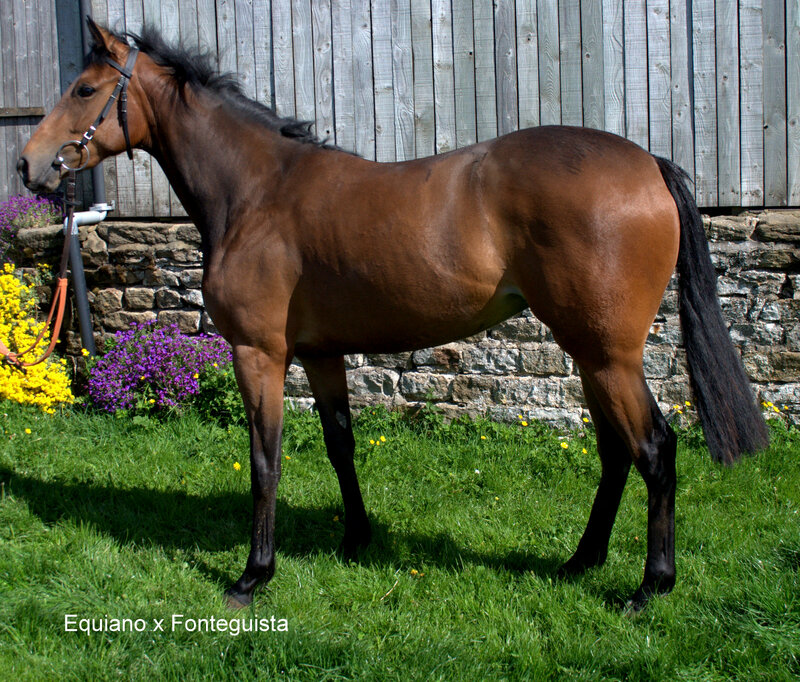 Back in November last year a lovely EQUIANO filly, bred by the sire's owner James Acheson, arrived at Ann Duffields Constable Burton Yard. With arriving so late in the year, having just come out of a field in Ireland, she was a lot more backward than the rest of Ann's yearling bunch. The majority of her other peers, had been through the sales ring, so were a lot more advanced in their education. One of the reasons she arrived at Ann's in the first place, was that her breeder said Ann had such a good record with the sire's progeny, so wanted to send her to Sunhill. It quickly became obvious that she would need time & patience, so Ann took the decision to turn her out for the summer in a field. That decision has now been rewarded, as she has really blossomed as a result. She is now in full work at the yard & Ann expects her to be ready to make her racecourse debut, at the end of September. We are now delighted to offer shares in this lovely as yet unnamed filly & will be holding an Open Morning at Ann's, so that people can get the chance of seeing her put through her paces on the gallops. This will take place at 10am on Sunday 11th September, where you will be able to watch her & our other GPR horses, Toboggan's Fire, Port Master & Davinci Dawn, work. Beef Sandwiches & other light refreshments can be enjoyed whilst chatting to Ann on her prospects, along with the filly's co owner, Claire King of Coronation Street & Emmerdale fame. Shares in this filly will be similar to those that we successfully sold in Toboggan's Fire(3 wins now). These will be in multiples of 1% shares at a one off payment of £340, which includes the purchase & all costs to the end of October 2017. You own that percentage of the horse & receive your percentage of all prize money & any monies if the filly is sold. Owner's Badges are on a draw rota basis, but a 3% share guarantees an owner's badge with every run. Also thee GPR August Newsletter is now out & well worth a read. It is full of updates on all the horses in the team & news of our latest four winners, that has taken our total to eleven for the season so far.